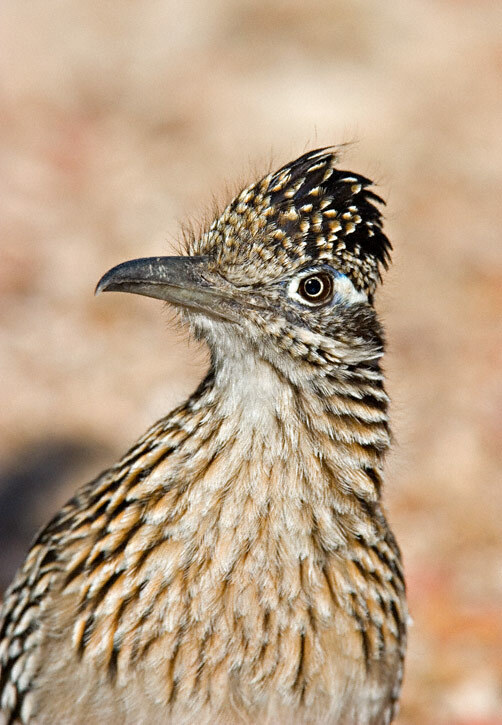 The Greater Roadrunner (Geococcyx californianus) is a resident bird across most of the American southwest as well as much of Mexico. 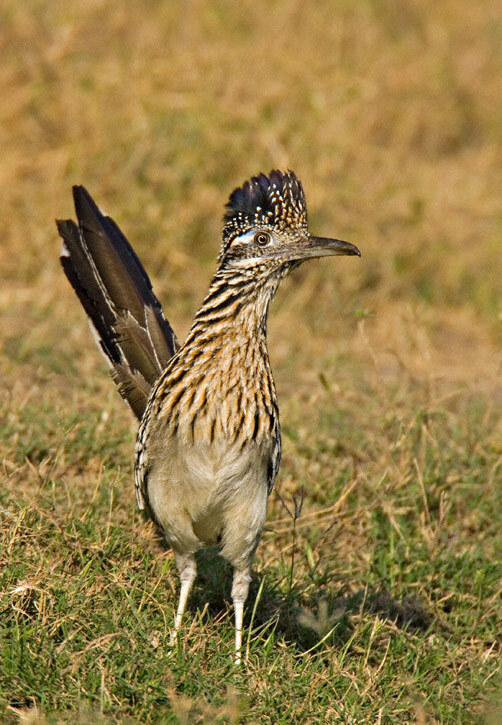 Perhaps no other bird species is as familiar to the general public as is the roadrunner. 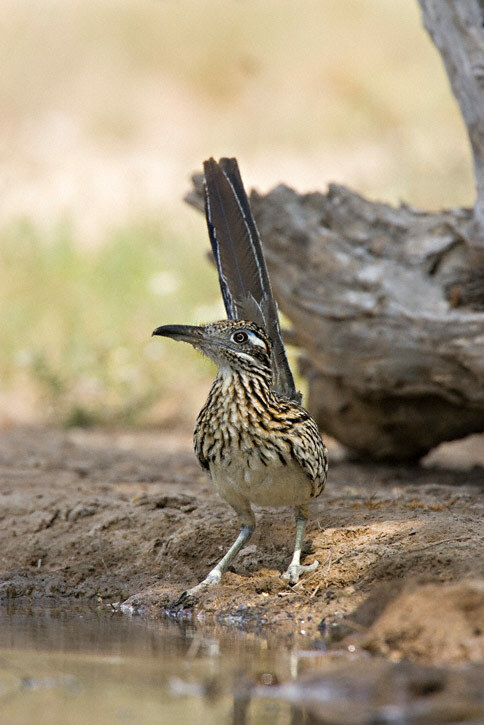 From cartoon characters to advertising icons, the roadrunner has gained a wide popularity across the United States. 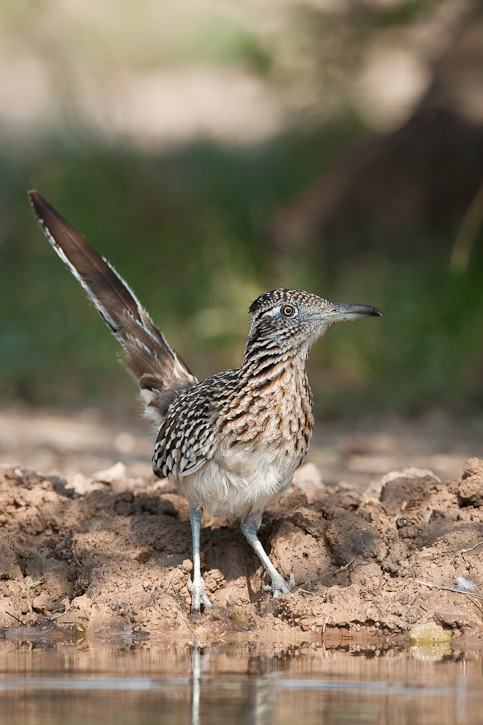 The Greater Roadrunner is a member of the cuckoo family and some of its vocalizations do indeed sound like a cuckoo. 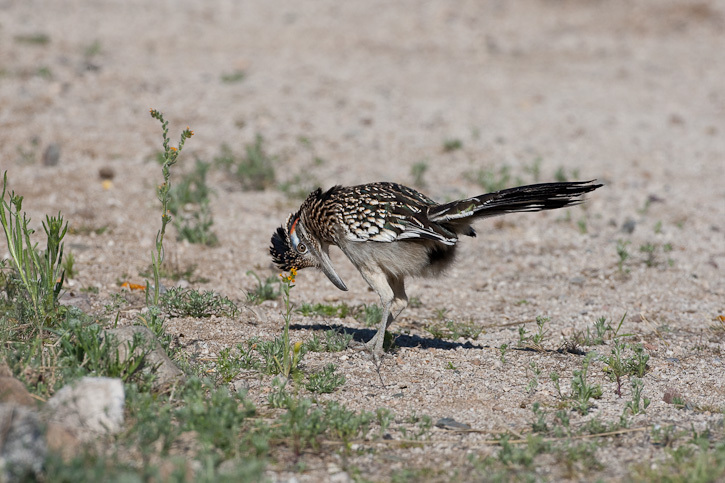 The bird spends most of its time on the ground and its powerful legs allow it to run very quickly across desert terrain as it hunts for insects, lizards, and small snakes. 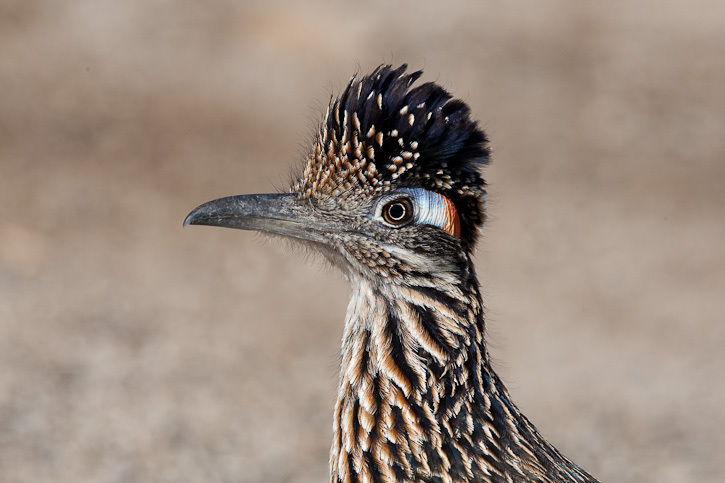 This shot was taken in Tucson, Pima Co., Arizona, in April, 2003 with a Canon EOS 10D and EF 600mm F/4 L IS lens. 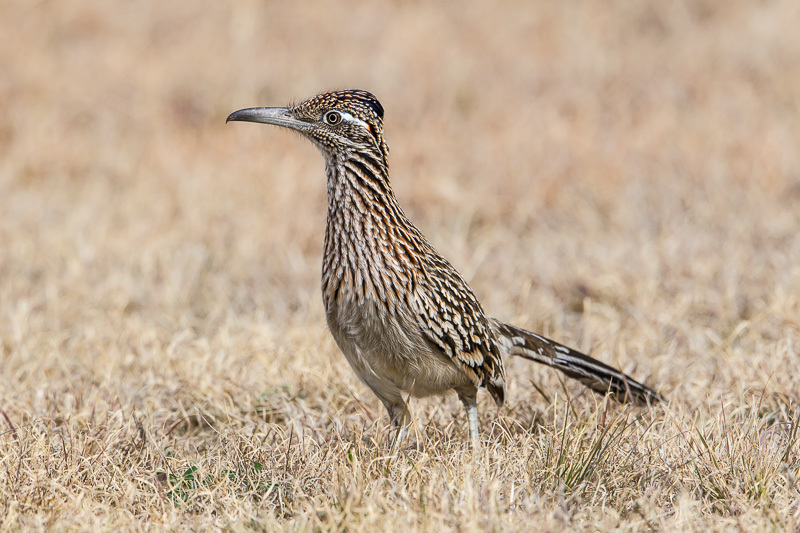 The next four shots were taken in Hidalgo Co., Texas in April, 2006, with a Canon EOS 1D Mark II and EF 500mm F/4 L IS lens. 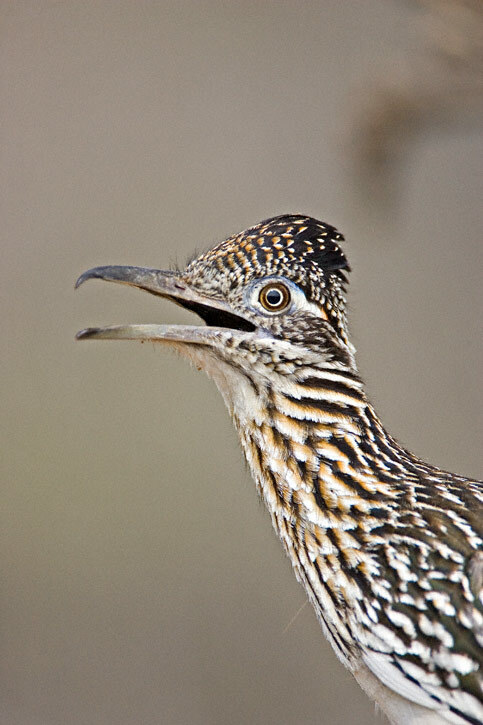 Greater Roadrunners sometimes perch up high in the morning and late afternoon while they call to proclaim territory. 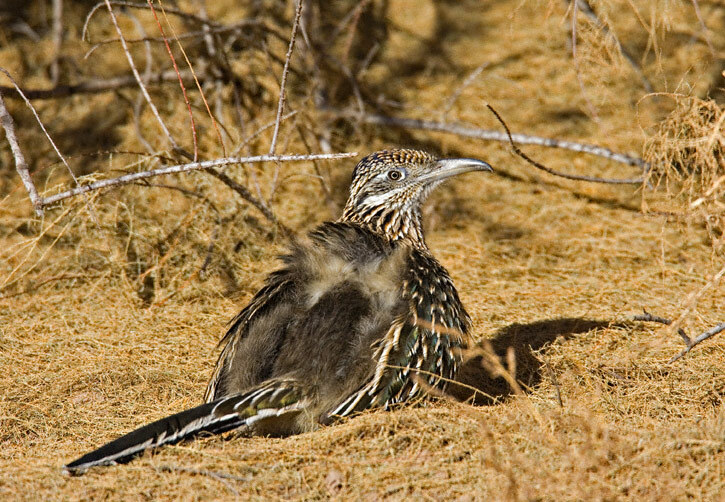 The shot here shows a Greater Roadrunner sunbathing on a cold winter morning in Socorro Co., New Mexico, in November, 2005. 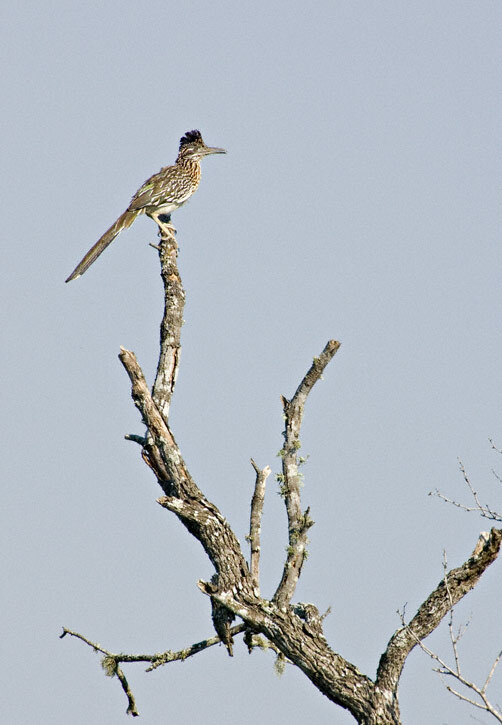 The image was taken with a Canon EOS 1D Mark II and EF 600mm F/4 L IS lens. 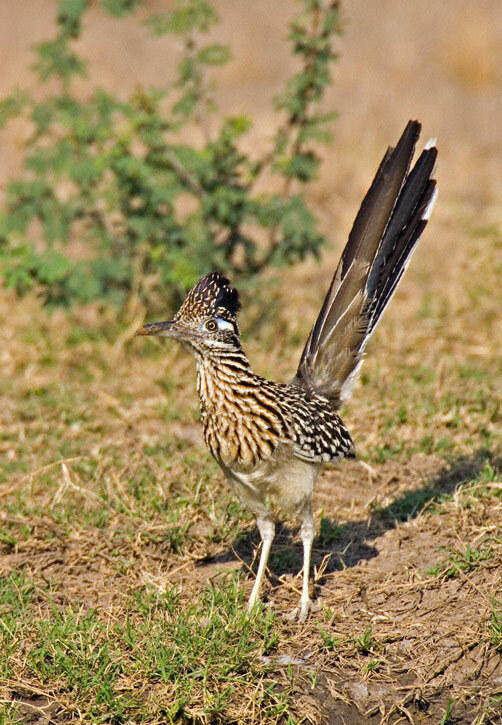 Sunbathing roadrunners open up the feathers of their back to expose their inner downy feathers to the warm sunshine. 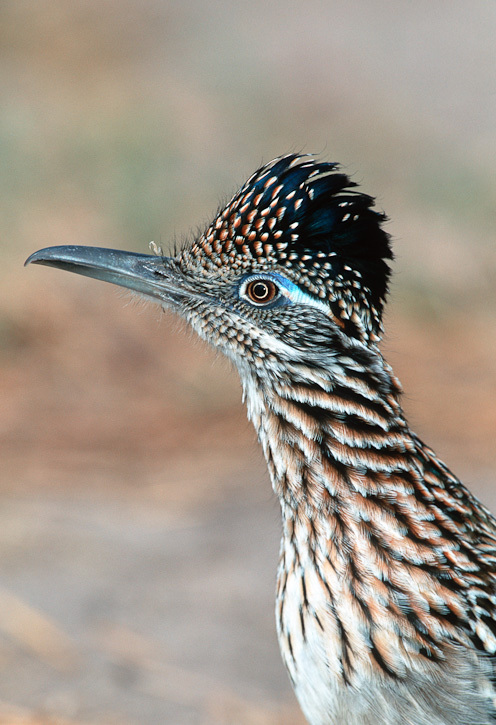 The head shot of the Greater Roadrunner shown here was taken in Kenedy Co., Texas, in January, 2000, with a Canon EOS 1N and Fuji Sensia film and an EF 600mm F/4 L lens. 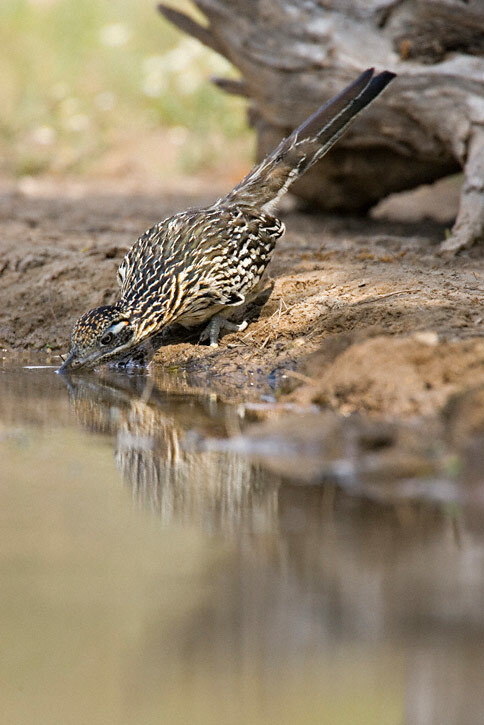 The next 4 shots shown here show a Greater Roadrunner approaching a water hole for a drink. These images were taken near Rio Grande City, Starr Co., Texas, in May, 2007, with a Canon EOS 1D Mark II and EF 600m F/4 L IS lens. 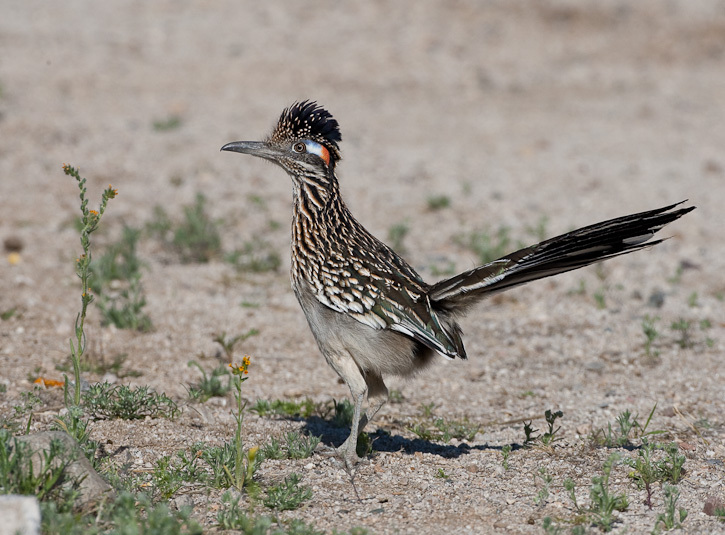 The Greater Roadrunner in the next 3 images was in Catalina, Pima Co., Arizona, in March, 2009. 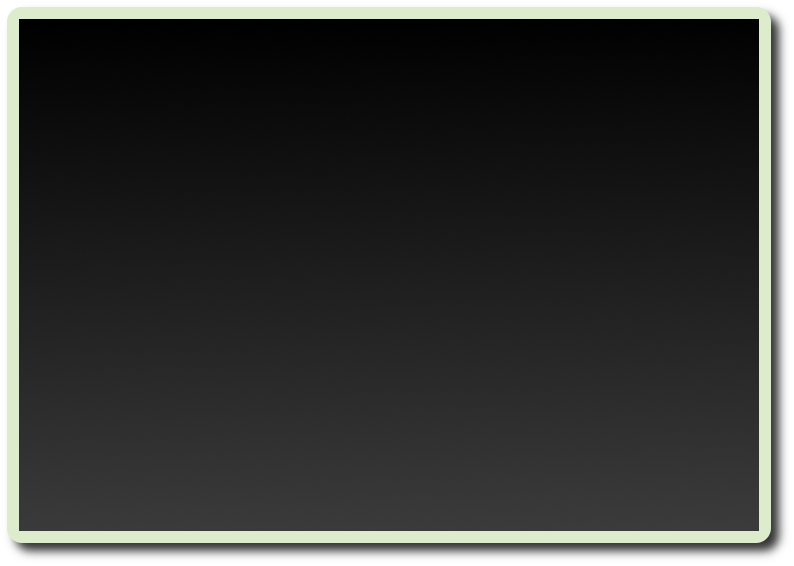 The bird is vocalizing in the 2nd image. These 3 shots were taken with a Canon EOS 1D Mark III and EF 500mm F/4 L IS lens. 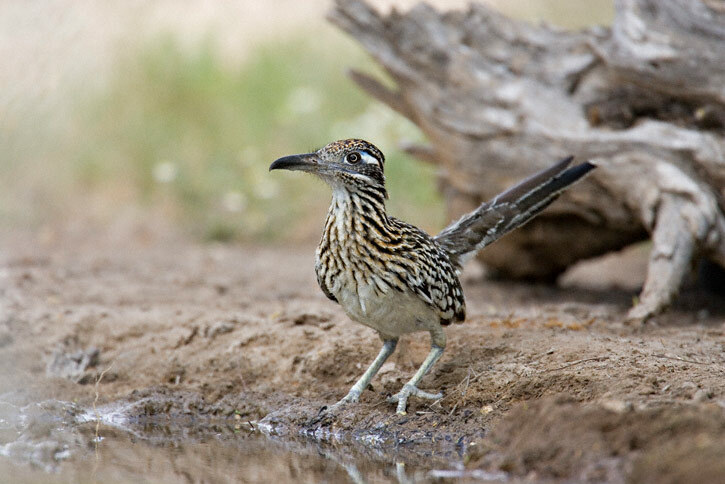 The roadrunner shown here was at Balmorhea Lake, Reeves Co., Texas, in March, 2009. 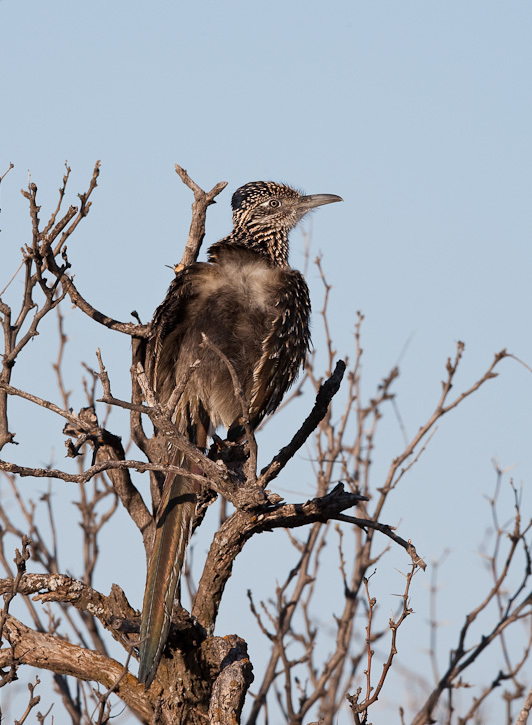 It was a cool morning and the bird was exposing its back feathers toward the morning sunshine. This shot was taken with a Canon EOS 1D Mark III and EF 800mm F/5.6 L IS lens. 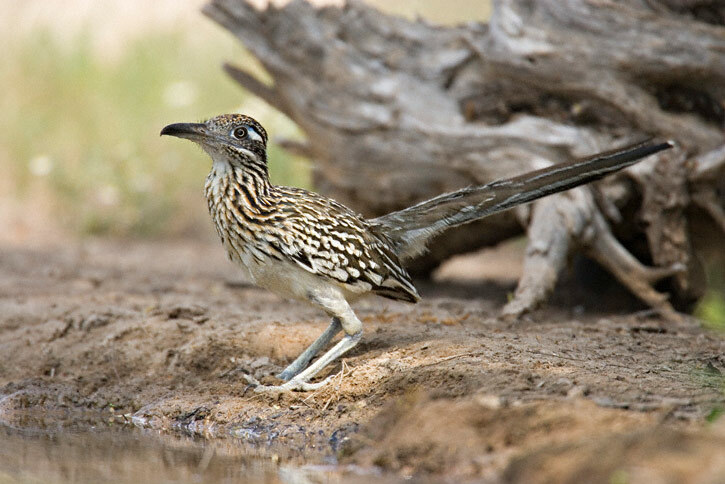 The Greater Roadrunner shown here was visiting a water hole in Starr Co., Texas, in April, 2009. 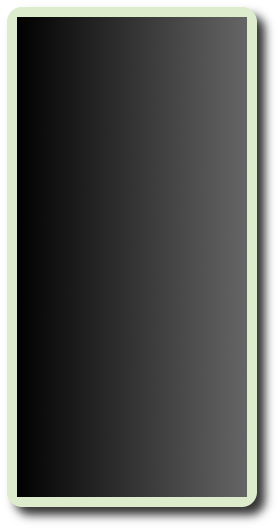 This image was taken with a Canon EOS 1D Mark III and EF 800mm F/5.6 L IS lens. 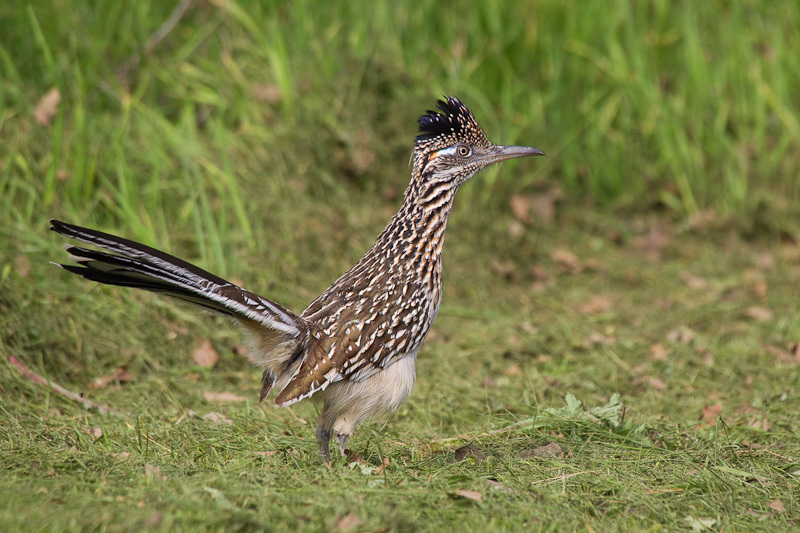 The Greater Roadrunner on the right was in Austin, Travis Co., Texas, in March, 2012.